I am interested in the physical/hydrological processes that occur in aquatic ecosystems that have an effect on the fish present. I am also interested in stream restoration and how we can best restore aquatic ecosystems in places where the hydrologic regime has been significantly altered and habitat has been severely degraded. Fish are hardy creatures and seeing populations bounce back from restoration efforts amazes me! I graduated in May 2015 from Utah State University and started working as a GIS Technician in the Fluvial Habitat Center (FHC). 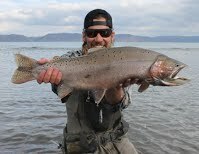 Prior to this position, I worked seasonally for the Utah Division of Wildlife Resources in the area of fisheries work. For now, I will continue to gain work and research experience in the FHC. I plan to go to graduate school within the next couple years, furthering my education in aquatic ecology. Outside of school and work, I spend the vast majority of time fly-fishing, the passion which led me to a degree in fisheries.